Two Black Brant XI-A sounding rockets were launched at 6:14 and 6:16 p.m. EDT on April 5 carrying scientific instruments for studying the energy exchange within an aurora. The AZURE mission is designed to make measurements of the atmospheric density and temperature with instruments on the rockets and deploying visible gas tracers, trimethyl aluminum (TMA) and a barium/strontium mixture, which ionizes when exposed to sunlight. The vapors were released over the Norwegian Sea at 71 through 150 miles altitude. These mixtures, using substances similar to those found in fireworks, created colorful clouds that allow researchers to track the flow of neutral and charged particles with the auroral wind. 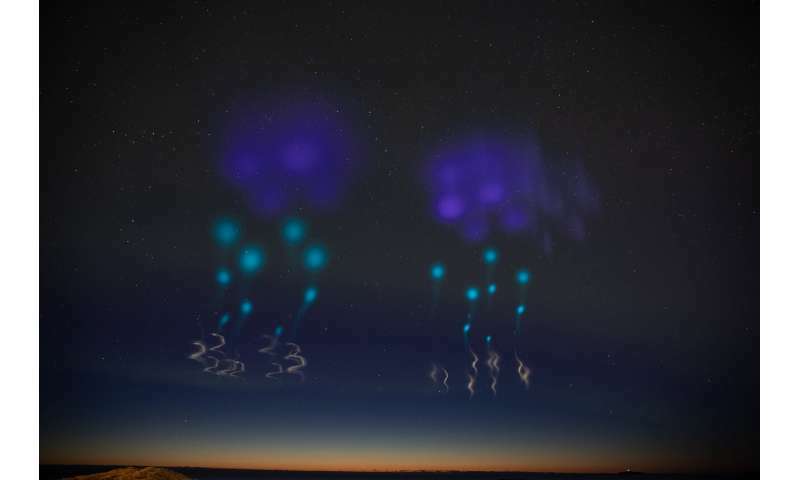 By tracking the movement of these colorful clouds via ground-based photography and triangulating their moment-by-moment position in three dimensions, AZURE will provide valuable data on the vertical and horizontal flow of particles in two key regions of the ionosphere over a range of different altitudes. Many people believe the Earth's atmosphere "ends" some 20-30 miles above the ground. However, the air we breathe does not abruptly end at some predefined point—instead, it gradually thins. At 150 to 200 miles above Earth, the "air" is extremely thin and these vapor clouds disperse rapidly and follow the winds which can be moving at a few hundred miles per hour. 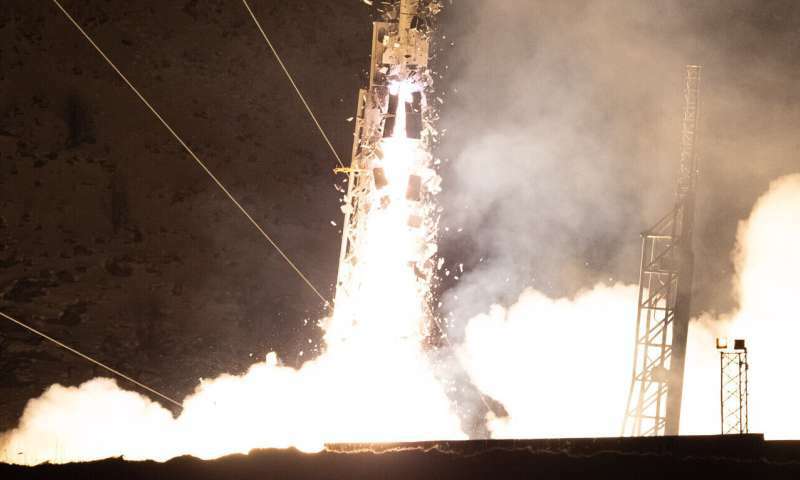 AZURE is one of nine missions being conducted as part of the Grand Challenge Initiative (GCI) - Cusp, a series of international sounding rocket missions planned for launch in 2018—2020. 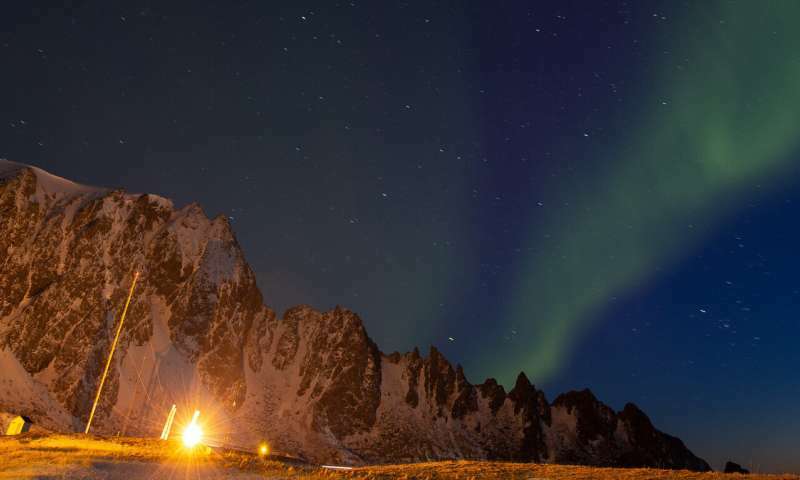 NASA and U.S. scientists are joining those from Norway, Japan, Canada and other countries to investigate the physics of heating and charged particle precipitation in this region called the geomagnetic cusp—one of the few places on Earth with easy access to the electrically charged solar wind that pervades the solar system. NASA previously conducted two missions in December 2018 and two in January 2019 as part of the Initiative. The final two NASA missions—the Cusp Heating Investigation and the Cusp Region Experiment—are scheduled for November 2019.